Goose Creek has been hit or miss for me lately so I find myself going into each review with a blend of skepticism as well as optimism. I really want to love this brand because they’re sales are so dang incredible but not every candle lives up to my expectations. Banana Pudding on first sniff smelled amazing. So, I really had high hopes with this one. I wouldn’t say it smelled like pudding but more of a warm banana nut bread and it truly smelled mouthwatering. So, crossing fingers it performs like I’m hoping it does. That’s a pretty good description. I keep going back to the candle to smell it and the more I do, the more I smell sweet bananas with vanilla and sugar. 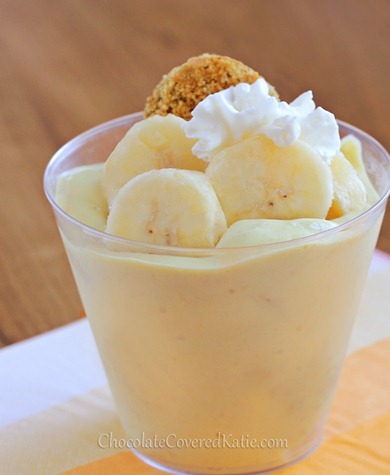 Sometimes I think it smells like banana bread, other times banana pudding. Either way, I liked what I was smelling and hoping the aroma stays true once burning. I lit this candle in my master bedroom to start out and ended up leaving it there till the very end. Once the wicks were lit, it took a good 20 minutes to reach a full melt pool and from then on out… a sweet candied banana aroma filled my bedroom and it smelled pretty darn good. The aroma reminded me of banana’s and sugar. Not banana bread or pudding but sweet banana’s and sugar. It was yummy! Strength – I would rate this candle a 7 out of 10 in a really large room. 10 in medium to smaller rooms. Nice scent throw. This candle burned pretty good. I did have to stay on top of wick trimming each day which is standard. Other than that, clean and even burn from start to finish. 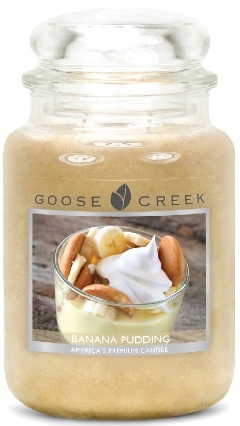 Banana Pudding was a winner and if you love sweet banana scents, this would be a good one to try. It wasn’t a banana bakery like I first thought it was, it was more of a sugary banana which was still pretty good. Goose Creek runs some amazing sales so definitely search for one of those when you’re ready to place an order. That’s what I do.